Their faith made their wedding day even more special. 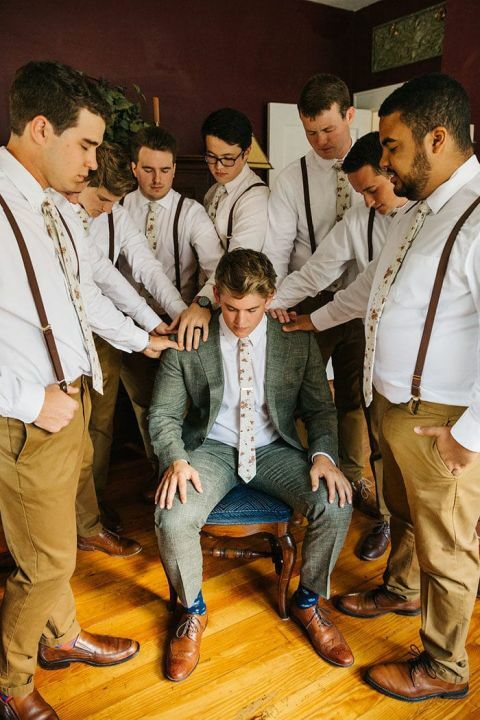 Tucker shared a moment of prayer with his groomsmen prior to the ceremony, which took place at the church he had attended in his childhood, Trinity Presbyterian Church. 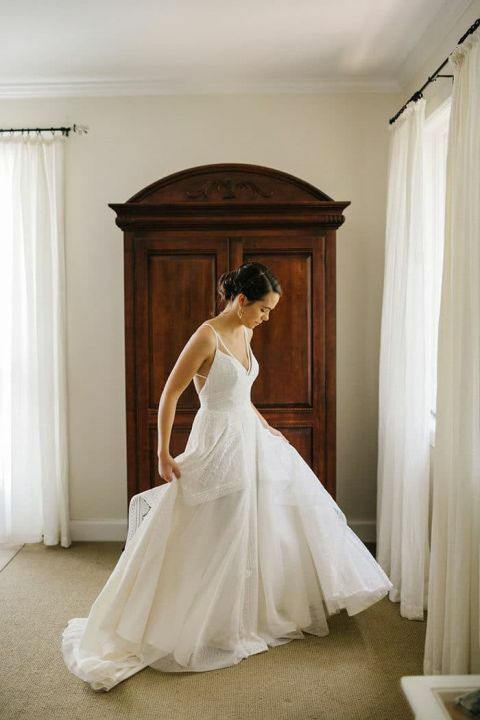 Ann felt that her Blush by Hayley Paige from The White Magnolia Bridal Collection was the perfect way to express her personal style in a bridal dress. She loved the simplicity of the layered skirt and the bohemian detailing that made it feel special. She wore her hair up to show off the criss-crossing straps of the open back, with a soft chignon by Perry Oakley with trailing curls for a less-formal but softly elegant look! Subtle gold jewelry finished off her look to perfection! Ashton Events Planning & Design created the flowers for their wedding day, including the bride’s bouquet filled with greenery. Eucalyptus in multiple varieties added texture and fresh color to the arrangement, with soft pops of white from rose blossoms, and Queen Anne’s Lace. One of their favorite moments of the day was the First Look. They loved the chance to take a quiet moment together before diving in to the excitement of the ceremony. The botanical garden where they first saw each other made for a gorgeous tropical backdrop for their intimate photos together! I love that Tucker embraced a more fashion-forward look for his groom’s attire, with this textured suit from Suit Supply in a subtle shade of green. The flower patterned tie really brought it all together! Ann and Tucker created a beautiful and thoughtful design element to tie all of their signage together – I love how cohesive it made everything feel! 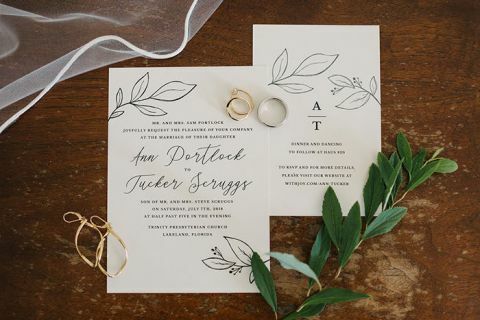 The simple elegance of their botanical print brought a beautiful branded element to their wedding signs, stationery, and ceremony programs! Their heartfelt ceremony celebrated the couple’s history together, from meeting in high school and falling in love through college. 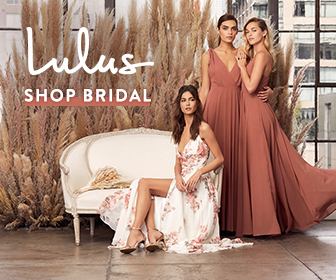 These two took neutrals to a chic new level with their bridal party! The groomsmen looked summery and relaxed in brown shoes and pants with suspenders instead of suit jackets. 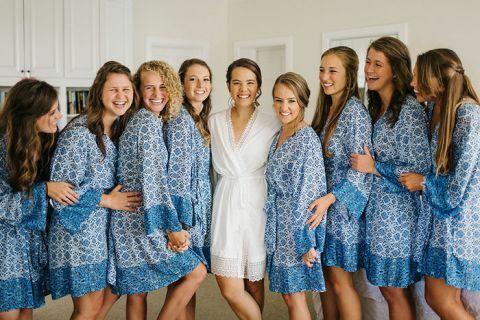 Ann gave her bridesmaids a directive for neutral, floor length dresses and let them find their own style for a mismatched yet totally elegant bridesmaids look! How fun are these color blocked backdrops! Renee Nicole Photography scouted eye-catching locations in Lakeland, FL, and hit the jackpot with these colorful brick walls! One of the many unique design elements that made their wedding day stand out was the hanging seating chart! It fit their style of simple and elegant, with long green ribbons hanging from a suspended branch. Alphabetical seating cards adorned with their signature botanical prints guided guests to their assigned tables with effortless style! Ann loved what their reception space at Haus 820 brought to her vision for a bohemian garden party. She wanted long farm tables to fill the space and create a family atmosphere, and added gold flatware, greenery, and candles to decorate the black tabletops. Terra cotta pots filled with fresh herbs doubled as centerpieces and table numbers! Even in a room filled with gorgeous displays, their dessert table stood out as a creative focal point! A greenery chandelier overhead drew the eye, even as the tabletop kept to their simple and organic style brief. The centerpiece was a three-tier salted caramel cake from J’aime Cakes, with clean white buttercream and wreaths of olive leaves for a lovely effect. 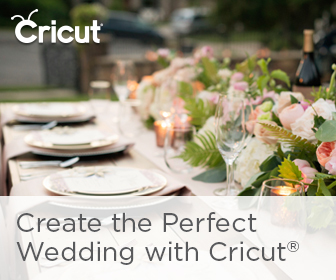 They also offered monogrammed cookies and a selection of pies – what’s a Florida wedding without key lime pie! Coffee was a must for these two – Tucker had proposed in a coffee shop, after all! Concord Coffee kept guests caffeinated and on the dance floor, with Pimm’s Cups as a signature cocktail in a nod to Ann’s mother’s British roots. Beer from one of their favorite local breweries, Grove Roots, also added to their guests’ experience. The dance party went down as one of their favorite moments of the day, with DJ Cory Barron keeping guests on the dance floor all night!